The Mental Capacity Act 2005 (MCA) provides a legal framework for acting on behalf of individuals who lack the capacity to make decisions for themselves. 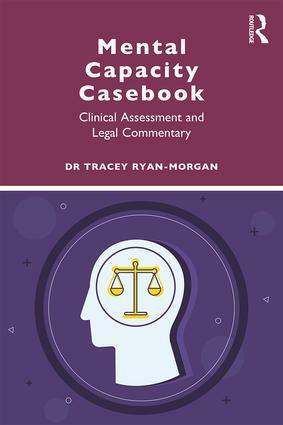 The Mental Capacity Casebook showcases numerous real-life case studies in accordance to this Act. Through the exploration of various mental capacity assessments, this book highlights the psychological needs of the individuals who are supported and protected by the MCA. Dr. Tracey Ryan-Morgan, a Consultant Clinical Neuropsychologist, is the first to bridge the gap between the individual’s psychological requirements and the legal framework surrounding them. Not only does this book present true, often complex, mental capacity assessments, it does so with legitimate corresponding commentaries. Each case outlines the presented problem along with its background, social context, psychological matters, the overriding opinion and concluding learning points. This book provides a unique standpoint, offering insight into the complexities of the Act and practical guidance on how to conduct assessments. It serves as essential reading for those looking for guidance whilst making complex capacity decisions, such as Clinical Neuropsychologists, Social Workers, and Legal Professionals. Dr. Tracey Ryan-Morgan is a HCPC Registered Consultant Clinical Neuropsychologist, an Associate Fellow and Chartered Member of the British Psychological Society as well as a Chartered Scientist, a Regional Fellow of the Royal Society of Medicine and listed on the Specialist Register of Clinical Neuropsychologists. She has worked in the NHS, Charity and Independent sectors. Tracey has consulting rooms in Wales and London.